The world economy is likely to be significantly less vibrant this year than had been thought just three months ago. That is the verdict by the International Monetary Fund (IMF) after trimming forecasts for world and regional growth for the fourth time--and the markets are not loving it. The fund’s new World Economic Outlook report, published Tuesday, projects the world economy will expand 3.3 percent in the current year down from an earlier forecast of 3.5 percent. For the world’s two largest economies, the IMF revisions moved in opposite directions, with U.S. growth getting a 0.2 percent downgrade to 2.3 percent, while China’s climbed 0.1 percent to 6.3 percent. World markets are downbeat after the report. Asian stocks seem to be hardest hit-- Japan’s benchmark Nikkei 225 (NIK), closed down 0.5 percent and has lost 0.53 percent in Wednesday mid-morning trading. In the same vein, India S&P BSE Sensex fell 0.9 and has slid another 0.93 percent on Wednesday. New Zealand’s( NZ 50) was down 0.8 percent and has lost another 0.81 percent on the day. China’s Shanghai Composite (SHCOMP) has remained flat on both sessions. On Wall Street, all major indexes are clawing back some of Tuesday’s losses. The S&P 500 Index (SPX) is up 0.25 percent on Wednesday after closing 0.6 percent lower to 2,878.20. The Dow Jones Industrial Average(DJIA) has gained 0.1 percent following Tuesday’s 190.44 points, or 0.7 percent, drop to 26,150.58. Similarly, the Nasdaq Composite (COMP) has climbed 0.24 percent after slipping 0.6 percent to close at 7,909.28. Meanwhile, the small-cap benchmark, Russell 2000 Index (RUT), is up 0.3 percent on the day after closing 1.2 percent lower. The IMF has warned that the balance of risks is significantly ‘‘skewed to the downside’’, particularly due to the overhang of unresolved trade disputes by the two protagonists. Failure to resolve the differences would result in an escalation in tariff barriers and lead to higher costs of imported capital and intermediate goods, which would consequently slow down the economy even further. In a more upbeat note, however, the lender said the global economy is likely to see an uptick in the latter half of the year due to several favorable factors, including a hiatus to the Fed’s quantitative tightening program, a possible trade pact between the U.S. and China as well as China’s ongoing stimulus measures. 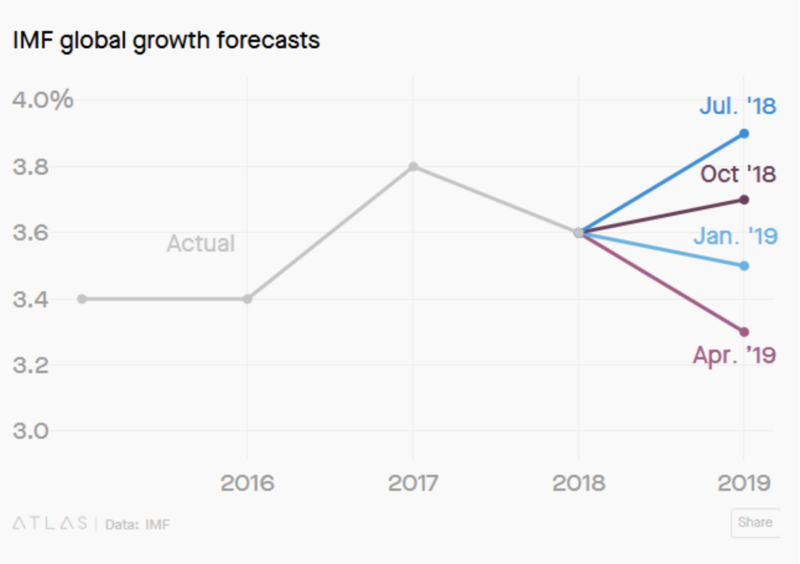 How reliable are IMF forecasts? The IMF’s forecasts are closely watched throughout the world and make for essential reading among economists, policy makers and traders. But how reliable are they? 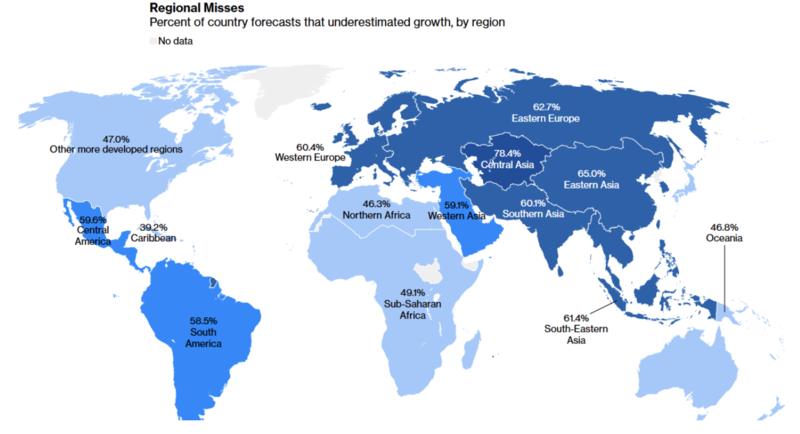 The organization’s global growth outlook for 2019 has gotten progressively gloomy as time goes by. The fund has made three revisions in the space of less than 12 months—all of them downward. Bloomberg has analyzed more than 3,200 same-year country forecasts by the IMF that it has published each spring since 1999. The reports have been found to have a wide variation in direction and magnitude of errors, with only 6.1 percent of the samples being within a margin of error of 0.1 percentage points. The rest have been almost evenly split, with the fund overestimating GDP growth in 44 percent of cases, while underestimating in 56 percent of cases. The average forecast miss has been 2.0 percentage points in either direction. The IMF has a much better track record for estimating growth for advanced economies than developing nations. The margin of error for advanced economies has been 1.3 percentage points vs. 2.1 percentage points for developing economies. Developing economies are generally harder to model mainly due to the difficulty in acquiring reliable data. But here’s where it gets interesting: Over the past 20 years, the IMF has overestimated U.S. growth 80 percent of the time compared to just 20 percent of the time for China’s growth. The Bloomberg heat map below shows that China is not alone: the IMF has a bad track record in Asia, underestimating growth more often than not. But before rushing out to contract a private prognosticator, consider that a 2014 unvarnished report published by IMF’s own Independent Evaluation Office concluded that the fund was no more or less accurate than private organizations. The independent report found no substantial positive or negative biases by the IMF, and the seeming discrepancies between US and China report have been rationalized. Specifically, the IMF’s relatively large forecast misses for China in the early 2000s could be due to China’s major backward revisions over the period. Likewise, the Bloomberg report has noted that IMF predictions have become more accurate ever since the financial crisis of a decade ago.